2 The King appoints Viscount Falkland appointed Secretary of State. 3 At the King’s command, Attorney-General indicts five members of the House of Commons for treason. 4 The King fails in his attempt to arrest the Five Members Pym, Hampden, Haselrig, Holles and Strode, also Lord Mandeville – (future Earl of Manchester). 5 King Demands the Five Members be handed over to answer the charges against them. His coach surrounded by hostile crowds on his return to Whitehall. 10 The King and Royal Family leaves Whitehall for Hampton Court. 11 The Five Members return in triumph to Westminster. 12 The King moves from Hampton Court to Windsor Castle. Lord Digby and Sir Thomas Lunsford attempt to seize the arsenal at Kingston-on-Thames for the King. 17 Sir Thomas Onslow musters the Surrey Trained Bands and secures the arsenal at Kingston-on-Thames for Parliament. 19 Parliament recruit for two new regiments of London Trained Bands. 31 Sir John Hotham and his Son, Captain Hotham with the East Riding Trained Bands secure the port and arsenal of Hull for Parliament. 12 Parliament submits a list of approved Lords-Lieutenant to the King, but he refuses to give up control of the Militia. 13 The Royal Family at Dover where they are joined by Prince Rupert of Bohemia, who offers his services to the King. 23 Queen Henrietta Maria, Accompanied by Prince Rupert sets sail for Holland taking the Crown Jewels to raise troops and supplies for the Royalist cause. 2 The King sets out for the north despite the remonstrance of Parliament. Both Houses resolve that the Kingdom should be put “in a posture of defence”, and appoints the Lords Lieutenant as commanders of the militia. 5 The Militia Ordinance Passed. 15 Parliament appoints the Earl of Warwick Admiral of the Fleet against the King’s wishes. Sir John Hotham arrives at Hull to take up his governorship. 19 The King enters York where he sets up his court. 23 Sir John Hotham refuses to admit the King and his entourage into Hull. 24 The King proclaims Sir John Hotham a traitor. 26 Parliament issues a declaration stating that Hotham cannot be declared a traitor without due process of law. 12 The King issues a warrant summoning the gentry of Yorkshire to attend him in arms. 17 The King orders the Law Courts to move to York. 20 The King forms a Lifeguard to protect his person, composed of gentlemen of undisputed loyalty. Sir Thomas Byron appointed commander, with the Prince of Wales an honorary captain. 28 Parliament orders the Sheriffs of all counties adjacent to Yorkshire to prevent the mustering of troops under any warrant served by the King. 2 The Nineteen Propositions sent to the King. 12 The King issues the Commissions of Array to all the Lords-Lieutenant throughout the kingdom. 18 The King rejects the Nineteen Propositions. 20 Magazines at Warrington secured for the Royalists by agents of Baron Strange. 2 The fleet declares for Parliament and accepts the Earl of Warwick as its Admiral. 12 Street fighting in Manchester between Royalist and Parliamentarian supporters when Baron Strange. Prince Rupert commissioned as General of Horse in the King’s army. 15 Parliament appoints the Earl of Essex as Captain-general. 2 Colonel George Goring, Governor of Portsmouth, declares for the King. 4 Action at Marshall’s Elm in Somerset. 10 Oliver Cromwell and Valentine Walton defeat an attempt by Cromwell’s cousin Henry to remove the plate of the Cambridge colleges. 15 Cromwell seizes the magazine at Cambridge. 17 Sir Bevil Grenville musters the Cornish cavaliers on Bodmin racecourse. 21 Prince Rupert Joins The King. 20 The King’s nephews Prince Rupert and Prince Maurice land at Newcastle. 22 The King raises the Royal Standard at Nottingham Castle. 7 Colonel Goring surrenders Portsmouth to Waller. 9 The Earl of Essex leaves London, intending to march upon the King at Nottingham. 10 The Earl of Essex at Northampton with 20,000 men. Rendezvous with contingents from the Midlands and East Anglia. 13 The King marches from Nottingham towards Chester, disbanding the hostile Nottingham Trained Bands and taking their weapons. He hopes to recruit in Wales and the Marches. 20 The King’s army reaches Shrewsbury and is joined by Patrick Ruthven, the Earl of Forth. 23 Action at Powick Bridge near Worcester. 24 The Earl of Essex’s army occupies Worcester. 25 Sir Ralph Hopton advances into Cornwall to join Sir Bernard Grenvile. 12 The King marches south-east from Shrewsbury, towards London. The King’s army at Kenilworth Castle. 23 The battle of Edgehill. 25 The Earl of Essex withdraws to Warwick. 27 The King takes Banbury. 29 The King enters Oxford in triumph. 3 The King marches from Oxford to continue his advance on London. 4 The King enters Reading. 5 Essex reaches St Albans. 7 The Earl of Essex arrives back in London to a hero’s welcome. Prince Rupert summons Windsor Castle to surrender, but the Parliamentarian commander Colonel Venn refuses. 12 Prince Rupert storm Brentford and sack the town. 13 The Earl of Essex’s army, reinforced by the London Trained Bands, faces the Royalist army at Turnham Green. The King decides to withdraw. 19 The King withdraws to Reading. 29 The King withdraws to Oxford, leaving Sir Arthur Aston to command the Reading garrison. 1 Newcastle forces the crossing of the Tees at Piercebridge. Sir William Waller storms and captures Farnham Castle. 3 The Earl of Newcastle enters York, securing it for the King. 5 Henry Wilmot storms and captures Marlborough for the King, completing the lines of defence around Oxford. The citizens of Oxford compelled to begin digging the city’s fortifications. 9 The Royalists settle on their winter quarters around Oxford. Parliamentarian prisoners of war brought to Oxford and set to work on building fortifications. 13 Sir William Waller takes Winchester for Parliament. 22 Prince Rupert sets out from Oxford to counter a Parliamentarian attack on Banbury. 7 Prince Rupert mounts an unsuccessful attack on Cirencester. 12 The King and the Princes Charles and James review Royalist troops at Oxford. 13 The King’s reply to the petition of the Common Council read in London. King Charles agrees to return to London on condition that the Lord Mayor and several named citizens are first placed under arrest. His terms are rejected. 18 Hopton appointed commander-in-chief of the Royalist western army. 19 Battle of Braddock Down. 25 Sir Ralph Hopton resumes the siege of Plymouth. 27 The Earl of Newcastle withdraws to York with most of the Royalist northern army. 28 Sir William Brereton defeats the Cheshire Royalists at Nantwich and advances into the Midlands. 1 Parliamentary commissioners present peace proposals to the King at Oxford, calling for a disbandment of both armies. 2 Prince Rupert storms and captures Cirencester. 11 Sir William Waller appointed Major-General of the Western Association. 22 The Queen’s convoy lands at Bridlington Bay, Yorkshire, with a large store of weapons and money sets sail for England, accompanied by Admiral Tromp. 7 Prince Rupert attempts to capture Bristol. 15 Sir William Waller secures Bristol for Parliament. 18 The Earl of Derby storms Lancaster. 19 Battle of Hopton Heath. 20 The Earl of Derby captures Preston. 24 Massey defeats lord Herbert’s Welsh at Highnam. 29 Prince Rupert marches from Oxford for the Midlands, intending to open a route south for the Queen’s convoy at York. 30 Battle of Seacroft Moor. 3 Prince Rupert storms Birmingham. Sir William Brereton attacks the Earl of Derby’s headquarters at Warrington. Brereton is driven off, but Derby remains hemmed in at Warrington. 5 Sir William Brereton’s second attack on Warrington repulsed. 11 Battle of Ancaster Heath, Lincolnshire. 12 The King offers his final peace terms, which are wholly unacceptable to Parliament. 13 The Earl of Essex marches from Windsor with an army of 19,000 men to besiege Reading. 14 Parliament rejects the King’s terms. Parliamentary commissioners at Oxford instructed to abandon peace negotiations and return to London. 15 Sir Arthur Aston defies the Earl of Essex’s summons to surrender Reading. 16 Bombardment of Reading begins. 21 Lichfield surrenders to Prince Rupert. 25 Sir William Waller takes Hereford. A Royalist relief force fails to relieve the siege of Reading – action at Caversham Bridge. 4 The Earl of Newcastle storms and captures Rotherham in Yorkshire. 5 Court-martial at Oxford of Colonel Fielding for surrendering Reading. 6 The Earl of Newcastle storms and captures Sheffield in Yorkshire. 16 Battle of Stratton, Cornwall. 20 Parliamentarians besiege Warrington in Cheshire. 21 Sir Thomas Fairfax Storms Wakefield. 27 Warrington in Cheshire surrenders to Brereton’s Parliamentarians. Sir George Booth installed as governor of Warrington. 11 The Earl of Essex occupies Thame in Oxfordshire. 13 The Earl of Essex’s advance guard occupies Wheatley in Oxfordshire. 17 A detachment from Essex’s army advances on Islip near Oxford. Prince Rupert leads a raid out of Oxford on Essex’s garrisons. 18 Action at Chalgrove Field. 25 A detachment of Royalist cavalry under Colonel Hurry sweeps around the rear of Essex’s army and plunders Wycombe. 7 Waller sets out in pursuit of Hopton’s Royalists making their way towards Oxford. 9 Prince Maurice fights a rearguard action against Waller’s advance guard, enabling Hopton’s army to retreat into Devizes. 11 The Parliamentarians besiege Devizes. 13 Battle of Roundway Down. 18 Prince Rupert marches from Oxford to join with the Western Army. 24 Prince Rupert summons Bristol. 31 Colonel Richard Norton’s attack on Basing House in Hampshire beaten off by the timely arrival of Lieutenant-Colonel Peake’s musketeers sent from Oxford supported by Sir Henry Bard’s cavalry. 1 The King enters Bristol, to the popular acclaim of the citizens. 10 The King besieges Gloucester. (10 Aug – 5 Sept) Colonel Edward Massey’s resolute defence inspires the citizens of London to rally to the help of the beleaguered city. 26 Essex’s army marches for the relief of Gloucester. 4 Prince Maurice takes Exeter. 15 The Earl of Essex makes a feint towards Worcester then unexpectedly turns south, hoping to return his army to London and avoid a confrontation with the King’s army. 18 Action at Aldbourne Chase. Prince Rupert hinders the Earl of Essex’s return to London, enabling the main Royalist army to block his route home at Newbury. 20 First battle of Newbury. 25 The Earl of Essex warmly received by Parliament on his arrival back in London. 16 A proposed march on Reading by the Earl of Essex and the London regiments. 4 Sir William Waller appointed commander of the South-Eastern Association army (Kent, Surrey, Sussex and Hampshire). 6 Waller marches on the Royalist stronghold of Basing House in Hampshire which commands the road from London to the south-west. 7 Waller’s first attack on Basing House frustrated by bad weather. 12 Waller’s second attempt to storm Basing House driven back. 14 Waller abandons his attack on Basing House. 8 John Pym dies of cancer. 9 Hopton takes Arundel Castle. 14 Sir William Waller storms the Royalist outpost at Alton in Hampshire, inflicting severe losses. 19 The Scottish invasion: The Scots Army of the Covenant under the command of the Earl of Leven crosses the River Tweed and marches into England. 20 King Charles commissions the Earl of Antrim to raise an army of 10,000 Irish soldiers for service in England and 3,000 for Scotland. 22 King Charles formally opens the Oxford Parliament. 26 The Oxford Parliament passes a declaration that the Scots have broken the treaty of 1642 and must therefore be treated as invaders. 27 The Oxford Parliament writes to the Earl of Essex requesting his assistance in bringing about peace. 3 The King proposes peace negotiations between the Oxford and Westminster Parliaments. 9 The Westminster Parliament rejects the King’s proposals and refuses to recognise the Oxford Parliament. 21 Prince Rupert relieves Newark. 27 Lord Hopton and Lord Forth take Alresford in Hampshire. 30 Hopton and Forth withdraw to Basing House, then to Reading. 17 Queen Henrietta Maria, who is pregnant, leaves Oxford to spend her confinement in Exeter. She will never see King Charles again. 25 Prince Rupert attends a Council of War at Oxford. He advises the King to defend the ring of fortresses around Oxford and to sustain them with a central cavalry force. 5 Prince Rupert leaves Oxford for the north. 13 The Earl of Essex’s army marches from London to join forces with Sir William Waller and move against Oxford. 17 The Earl of Essex advances to Henley-on-Thames. 18 The King orders the evacuation of Reading. Its garrison is incorporated into the Oxford army. 19 The Earl of Essex and Sir William Waller move in to occupy Reading. 25 The Royalists abandon Abingdon, one of the inner ring of fortresses protecting Oxford. 26 The Earl of Essex occupies Abingdon. 1 A raiding party from Basing House defeated by Colonel Norton near Odiham, seriously weakening the garrison. 2 Sir William Waller seizes Newbridge near Oxford to control crossings of the River Thames above and below the city. The Earl of Essex reaches Islip, north-east of Oxford. 3 King Charles makes a feint attack towards Abingdon, forcing Waller to fall back to its defence. The King’s army marches north from Oxford towards Worcester. 5 The King’s army at Evesham. 6 The King’s army reaches Worcester. 12 King Charles withdraws from Worcester and falls back to Bewdley. 13 Royalist Council of War at Bewdley. The King decides to return to Oxford and gather reinforcements to fight Waller. 21 The King’s army, reinforced with infantry from Oxford, musters at Woodstock. 29 Battle of Cropredy Bridge. 30 Prince Rupert at Knaresborough. 2 Battle of Marston Moor. 11 Colonel Norton’s forces begin constructing siege works for the second siege of Basing House. The Marquis of Winchester rejects his summons to surrender. 16 Sir Thomas Glenham surrenders the city of York to Lord Fairfax. 20 Waller’s army re-occupies Abingdon. 31 Colonel John Boys rejects Lieutenant-General Middleton’s summons to surrender Donnington Castle. Middleton’s attempt to storm the castle is repulsed. 21 Battle of Beacon Hill. 31 Battle of Castle Dore. 9 Colonel Henry Gage leads a relief force from Oxford to bring supplies of ammunition and gunpowder to Basing House. 12 Colonel Gage plunders Basingstoke market to re-provision Basing House. 29 The Earl of Manchester arrives at Reading. 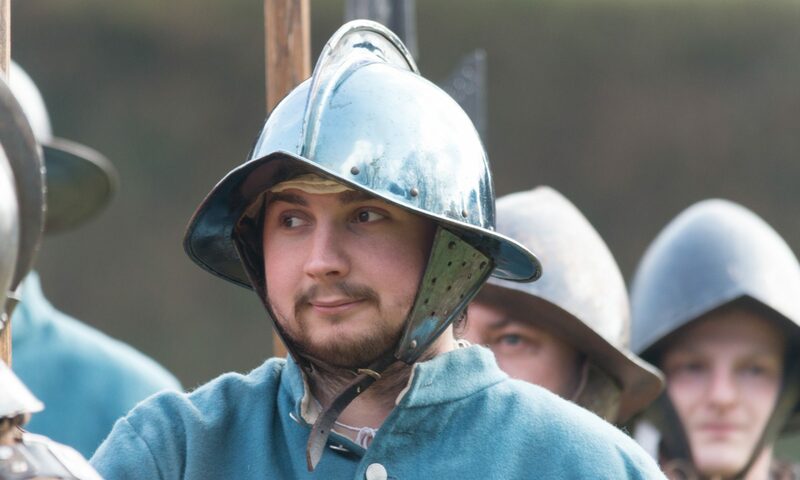 Colonel Jeremy Horton resumes the siege of Donnington Castle outside Newbury. 15 The King’s army advances to Salisbury. 17 The Earl of Manchester advances to Basingstoke. 18 Lieutenant-General Goring drives Waller back from Andover. The King’s army occupies Andover. A brigade of London Trained Bands reinforces the garrison at Reading. Colonel Horton abandons the siege of Donnington Castle. 19 The armies of Manchester and Waller join forces at Basingstoke. The King advances to Whitchurch. 20 The town of Newcastle falls to the Scots. 21 The Earl of Essex joins Waller and Manchester at Basingstoke. 22 The King reaches Kingsclere, five miles south of Newbury. 23 Rather than march to relieve Basing House, the King’s army takes up a defensive position at Newbury. A detachment under the Earl of Northampton sent to relieve the siege of Banbury, 50 miles to the north. 25 The Earl of Northampton relieves Banbury Castle. 27 Second battle of Newbury. 6 The King reviews his army of 15,000 troops at Oxford. Prince Rupert appointed Lieutenant-General of all the King’s armies. 9 The King and Prince Rupert relieve Donnington Castle and recover the Royalist artillery. 19 The Parliamentarian army retires to winter quarters at Reading. Colonel Norton abandons the siege of Basing House. 23 Royalist army retires to winter quarters at Oxford. 6 Committee for Both Kingdoms recommends the creation of the New Model Army. 11 Prince Rupert attacks Parliament’s garrison at Abingdon, but is repulsed by Major-General Browne. Sir Henry Gage mortally wounded at Culham Bridge nr Oxford. 27 Sir William Brereton’s forces attempt to scale the walls of Chester but are driven back. 29 Opening of the Uxbridge Treaty between representatives of the King, Parliament and the Scots. 17 Ordinance for the New Model Army passed by the House of Lords, proposing the formation of a Parliamentarian army 22,000 strong on a national rather than regional basis. 19 Prince Maurice advances from Worcester and relieves the siege of Chester. 22 Ending of the unsuccessful Uxbridge peace negotiations. 23 Langdale and the Northern Horse at Banbury in Oxfordshire. 13 Sir William Brereton renews the siege of Chester after the departure of Prince Maurice. 31 Parliament imposes fixed taxes to finance the New Model Army. 4 The Formation of the New Model Army. 5 Major-General Skippon takes command of five infantry regiments of the Earl of Essex’s army at Reading. 24 Cromwell defeats Northampton near Islip. 30 Sir Thomas Fairfax marches from Windsor with the main body of the New Model Army to raise the siege of Taunton. Lord Goring with 2,000 horse reinforce the King’s army at Oxford. 2 Cromwell and Fairfax rendezvous at Newbury. 3 Lord Goring arrives at Faringdon Castle near Oxford. 5 Prince Rupert and Maurice arrive at Oxford to confer with the King. 9 Battle of Auldearn. The Marquis of Montrose defeats Colonel Hurry. 10 The King’s army is joined at Evesham by Sir Jacob Astley with three thousand foot. 20 The King turns for Newark. 22 The New Model Army surrounds Oxford. 26 General Massey storms and captures Evesham, breaking up Royalist lines of communication between Oxford and Worcester. 1 Parliament orders the New Model Army to march north from Oxford against the King. Royalist begin gathering supplies for a relief convoy to Oxford. 21 4,000 Royalist prisoners from Naseby and 50 captured standards paraded through London. 4 Prince Rupert at Bristol. 8 The King’s army at Bridgnorth in Shropshire. 20 The King retreats from Yorkshire towards Newark. 28 The King arrives at Oxford, his army is quartered in garrisons around the city. 30 The King’s army marches from Oxford to raise the siege of Hereford. (September – November) Clubmen risings in Berkshire, Sussex, Hampshire, South Wales. 1 The King’s army reaches Worcester on its way to raise the siege of Hereford. 14 Cromwell storms and sacks Basing House. 1 The King leaves Newark. 5 The King reaches Oxford. 21 Last Royalist army dispersed at stow-on the-world. 5 Charles surrenders to the Scots at Southwell. The English Civil War by by Peter Young , Richard Holmes.